It's Release Day at Paper Sweeties today, and that means you can now purchase the three fabulous new stamp sets, and two fabulous Sweet Cuts (dies) from this month's release. There's a new sports themed stamp set called Score, a cowboy themed stamp set (for Jake) called Howdy Ya'All, and an adorable new stamp set for personalizing your cards that's called Handmade For You. 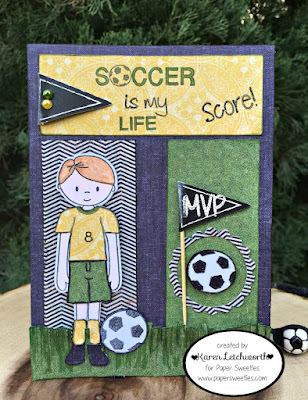 For today's post, I've used the sports themed set, Score, along with the smallest circle from the Circle Scallop Frames Sweet Cuts. I also used the new Handmade For You stamp set to personalize the back of my card (final photo). I had SO much fun with this adorable new set. First, I stamped Jake on white card stock, colored him with my Copics, and cut him out with the coordinating Jake Sweet Cuts. 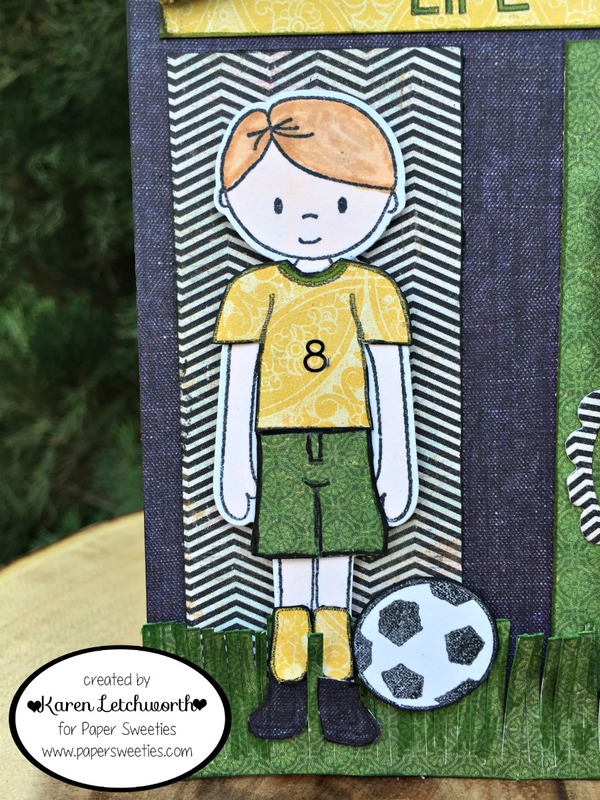 Next, I used the Score stamp set to clothe him in his soccer gear. I stamped Jake's top and socks onto yellow patterned paper, his shoes onto black, and his shorts onto green patterned paper. I used all those same patterned papers to create my background. 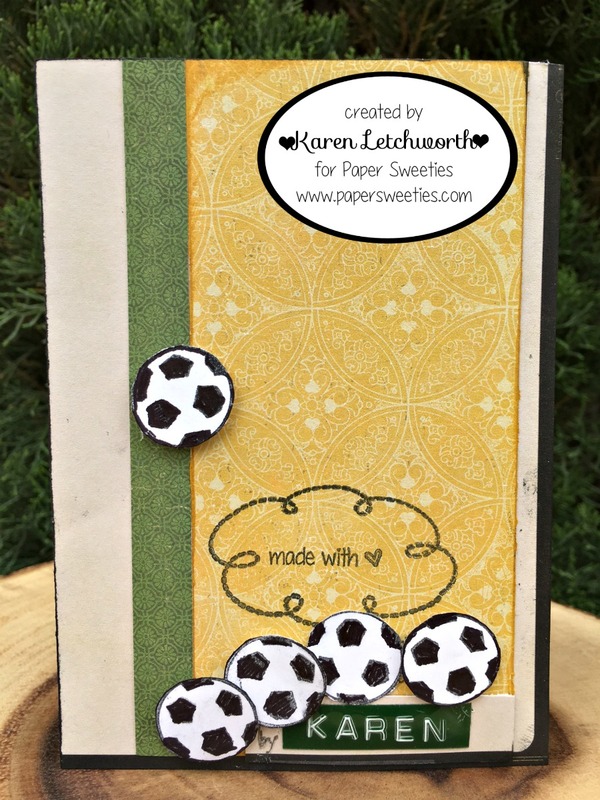 I also cut the smallest circle from the new Scalloped Circles Sweet Cuts from patterned paper and used it to surround one of the soccer balls (which is also found in this fabulous new set). As I mentioned earlier in my post, I used the adorable new Handmade For You stamp set to personalize the back side of my card. This sweet set has several cute sentiments to help you personalize your cards so that everyone will know that YOU hand-made it for them, and so that wherever your card may travel, your mark will always be on it. You know that saying, "when you care enough to send the very best...."? Well, in my opinion, when you care enough to send the very best, you make it yourself! And this new Handmade For You stamp set will help you let everyone know that YOU made it. Jake sure looks like he's all ready to play soccer, and this fun stamp set has all the images you need to help let everyone know that you support your little superstar, and help them feel encouraged and ready for his or her next (soccer, basketball, etc.) game, and to help celebrate, document and cherish these adventures. You could tape a photo of your little athlete to the inside of this card to save as a keepsake from that day. What a great way to scrapbook and capture memories of all those soccer, basketball and sporting games. This adorable new Score stamp set is filled with fun! Below is the list of all my Paper Sweeties teamies who have prepared something special for today's April Release Party. Be sure to stop by and leave them some love, and you will be delighted and inspired by their sweet creativity using these fabulous new sets from Paper Sweeties. Love your card with Jake all ready for soccer, Karen!! Fab design to incorporate so many awesome stamped images and sentiments!! 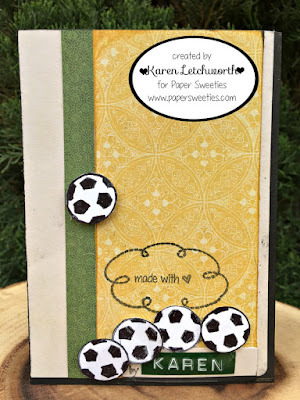 And, so awesome how you designed the back of the card with all the soccer balls and hand stamped sentiment...love it!! Karen, these are great masculine cards. Cute masculine card. Lot's of paper piecing. great layout. fun fun fun any boy would love this. The back of your card is just as pretty as the front! Super cute!